Fantastic new bach in a quiet cul-de-sac only 3 minutes walk to the beach. Brilliant indoor/outdoor flow with Bi-fold doors opening onto two decks. 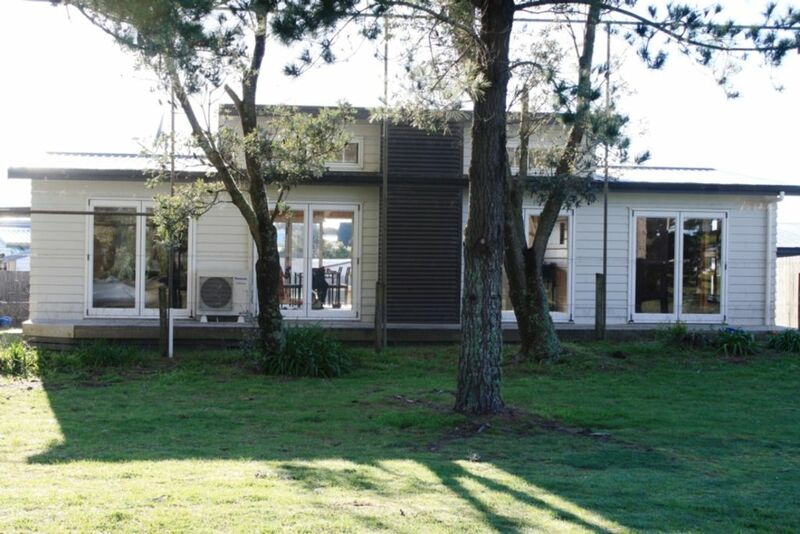 The front deck is perfect for entertaining with outdoor dining and views to Mount Pauanui. While the back deck overlooks the tranquility of the 2nd hole of the Pauanui Pines Golf Course, a great place to relax out of the sun. The house is fully furnished with all the expected mod cons of home, complete with espresso coffee machine, heatpump, dishwasher, BBQ and even a box of books and toys for the kids to play with. Park your cars or boat under the fully covered carport. Enjoy golf, tennis, fishing, boating, beaching or even a coffee at the cafes at the Pauanui shops. The Bach can also be used as your base for amazing day trips to many of the attractions the Coromandel Peninsula offers to visitors. For those wet days the bach has a large LCD flat screen plus Freeview decoder (Sky compatible), just bring your digital Sky card and you will receive your normal Sky services, so you won't have to miss out on any sport or regular TV shows (compatible with recent Sky digital cards only). Additional to the nightly rental is a cleaning charge that we arrange with a local cleaner for the day of departure (indicative pricing for this is $60). No pets - no exceptions. Please don't ask as refusal often offends. Please note that over the peak Christmas/New Year period the minimum stay period is 7 nights. Please note that we require a $300 bond for all rentals. The bond is refunded following property inspection post your stay. We also have a hot outdoor shower that is essential when the family comes back from a long beach session. We are a short walk (3-4 mins) away from Pauanui white sand beach which generally has gentle surf allowing the family to have fun at the beach. The estuary (near the wharf) is also child friendly. Our bach looks out over the 2nd hole of the Pauanui Pines golf course. 6km Panasonic Heat Pump unit. A 6kw Panasonic Heat Pump which is great for heating up the bach quickly. External washing line behind the shed and also a portable dryer located in the master bedroom wardrobe. Onsite carport that can fit 2 x cars, parking available on the grass, also extra parking on the grassed area of the roundabout. Breville espresso coffee machine. Performs well using espresso pre-ground beans. We also have some stove top espresso pots, a coffee plunger or instant coffee in the pantry. Freeview channels available, however you can also bring your sky digital card and insert this into the unit to get all your normal Sky TV channels. We have a selection of games to use located under the TV. We have a box of toys near the TV for your young kids to play with. We have a modern gas BBQ with hot plate, grill, hood and side burner options. Free tennis courts available located around Pauanui. The best ones to use are located at Kennedy Park. Pauanui Pines golf course accessible through a gate straight onto the 2nd hole. Amazing place in an awesome area! We had an amazing time in our 2 nights at this bach, the house is very modern and nicely set up with plenty of beds for a large group. Great location with just 5 minutes walk to the beach, Loved it! Great location, walking distance to the beach and golf course. Wonderful for children, as it is situated off the street and thank you for the many toys for the little ones to enjoy!! Great layout and everything you need to enjoy a fabulous family holiday. Modern and well equipped. Good location near the golf course, comfortable furnishings. and fittings. Grandchildren loved the toys. Modern and comfortable bach with good location to everything. Thank you for accommodating us. Thank you for accommodating us. We enjoyed our stay. Bach was spacious, clean and kids-friendly too! Plus ,close to the beach. overall, we had a great stay. Highly recommended!? ?